"Tis the season, to spend all your money... fa la la la laaaa!" Not on our watch. We spend hours everyday finding the best deals to save you guys stacks of cash. Just now, we know that it's mainly toys that you are spending on, so here's an offer you cannot refuse. Amazon have a MASSIVE selection of toys on 'Buy three get one FREE'. Just click the link below, select the three toys you wish to purchase and enter promo code TOYS3FOR2 at the checkout. Voila! You have saved yourself £££'s. 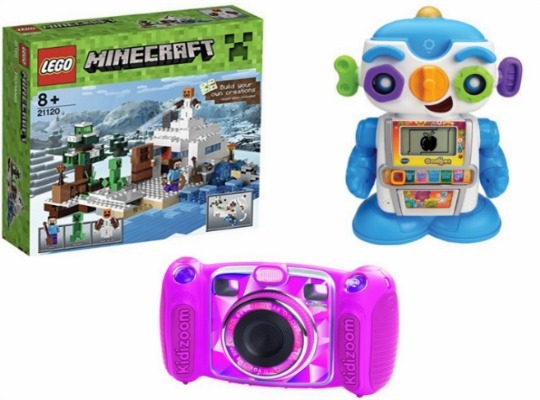 Here are some examples of the savings that can be had in the Amazon 3 for 2 offer: Buy VTech Gadget the Robot* at £39.99 plus VTech Kidizoom Duo*at £39.99 and get Lego Minecraft: The Snow Hideout* for FREE when it should have cost you £38.47. There are lots and lots of great toys included in this deal. 245 in total so you should be able to find a fair few items to save on. You can have your Toy order delivered for FREE if you have Amazon Prime or are spending £20 or more. If you don't have Amazon Prime and your not planning on spending £20 or more, then delivery will be £3.30.